U.S. Curling Team Beats Russian Athletes To Kick Off Pyeongchang Olympics : The Torch The first games of the Winter Olympics have begun, with two U.S. curlers taking on a Russian team to start things off in a mixed-doubles tournament. American siblings Matt and Becca Hamilton (far left and far right, respectively) beat the Russian team of Alexander Krushelnitskiy and Anastasia Bryzgalova, as the Pyeongchang Winter Olympics' first competitions began on Thursday. The Russians wore simple black and white uniforms. Other than their names, their jerseys bore only one tag: Olympic Athlete From Russia – a requirement of anti-doping penalties against their country. The two teams had a customary handshake at the start of the match, and the Russians also brought a gift. After the teams were introduced, Anastasia Bryzgalova ran over to the Americans and presented a stuffed brown bear to Matt Hamilton. This is the first time the Olympics have featured mixed doubles, a form of play that has been part of the world championships since 2008. The Hamiltons used their more accurate delivery to overcome the Russian pair, whose past success includes a gold medal at the 2016 world championship. In the first end, the teams took turns seeking control of the target area, with Matt Hamilton successfully dislodging two Russian stones from the house, the inner circles where points are scored. 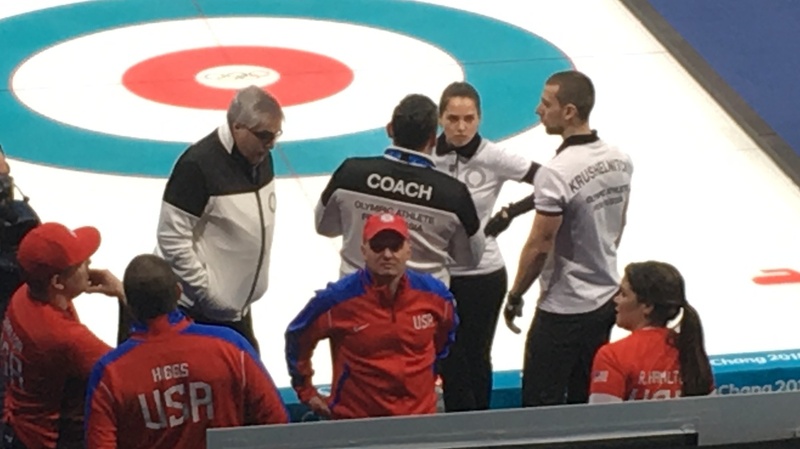 After the Russians re-established themselves, Becca Hamilton cleaned them out again and left the Americans' stones in place, taking a 3-0 advantage in the first end. Trying to add to their edge in the second end, the Hamiltons grouped four stones on the red circle to the Russians' two. But the center then became clogged with six stones – and the Russians used their last stone to secure an advantage and take two points. The Hamiltons settled in from there. After six ends, the score was 7-3 and the Wisconsin natives were well on their way to their first victory in Pyeongchang. The match went quickly, a hallmark of the mixed doubles format. And in this match between representatives of rival nations, there were no signs of awkwardness out on the sheet — other than an incident midway through, when Matt Hamilton got tangled up with his counterpart, Alexander Krushelnitskiy. As they attempted to sweep stones along the outer ring, Hamilton fell to the ice and Krushelnitskiy quickly gestured an apology. The two shook hands, and Hamilton headed back to the other end with a smile on his face. The first meaningful competition in the 2018 Olympics brought an appearance by the Olympic mascot Soohorang. And as play began inside the arena, the Olympic torch was making its way through streets nearby, destined to arrive at Olympic Stadium for the opening ceremony that will be held Friday night in Pyeongchang (Friday morning in the U.S.). The Winter Olympics run through Feb. 25, and curling has one of the longest competition schedules at the Winter Olympics.